I have known the super talented architect and designer Antonio Pio Saracino for a few years now and have always been a fan of his contagious energy and his positive outlook in life. Antonio, who has had a celebrated and prolific career, participated in the 54th edition of the Venice Biennale and has won numerous awards such as the American Architecture Award from the Chicago Museum of Architecture; was named one of the world's 25 most interesting trendsetters by ARTnews magazine and recognized as one of the Top Ten Italian Architects under 36 by the New Italian Blood award. Antonio standing in front of his sculpture "Hero"
His latest project, The Guardians: Hero and Superhero, were conceptually born about eighteen months ago. 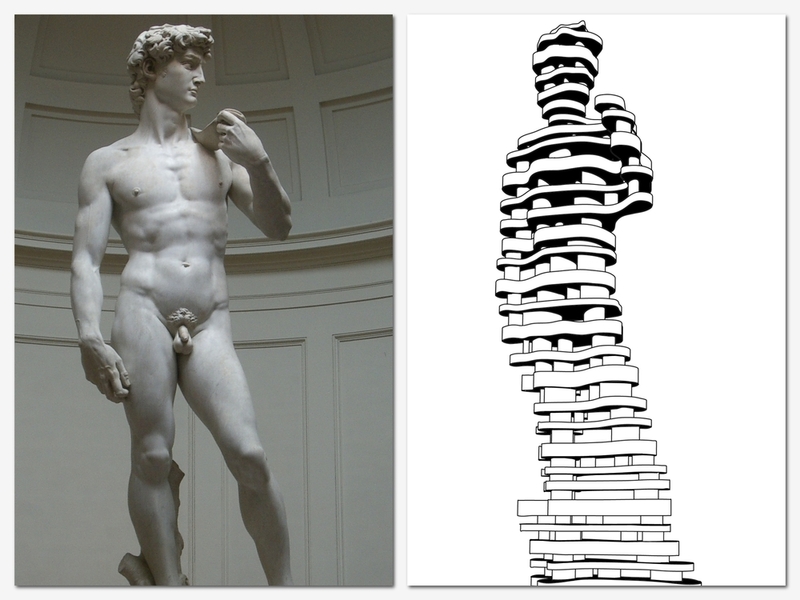 Antonio was chosen by the Italian government and its diplomatic mission in the United States to create a symbol of Italy in New York on the occasion of the Year of Italian Culture in the U.S.
On the left, Michelangelo's "David" who inspired Antonio's project; on the right is Antonio's sketch of "Hero". An important part of Antonio’s design practice comes from bridging the gap between old and new; between tradition and innovation. Not surprisingly then, he looked at his Italian roots to develop the foundation of what would be these two 13-foot-high statues. Hero is an 8,000-pound marble sculpture, which is a reinterpretation of Michelangeloʼs David, defender of the city of Florence and gazes uptown from 42nd Street as a protector from the past. Its counterpart, Superhero, who dons a cape as an icon of the present, watches over downtown from 41st Street. It is made of stainless steel and weighs 10,000 pounds. 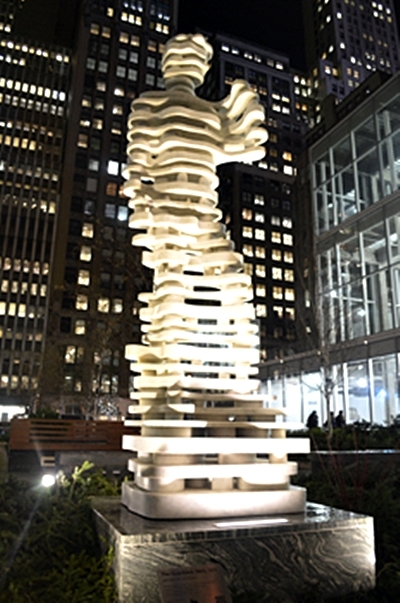 Both pieces were fabricated in New York City. As Antonio and I sat together at the feet of these magnificent pieces, I can’t stop thinking how big of a responsibility and honor it is for a young architect like him to have been commissioned such a big project. Saracino is very proud of the results and quite aware of the opportunity that was given to him, noting that both sculptures will remain on view indefinitely,creating a new landmark in the center of Manhattan. For anyone who hasn’t seen them yet, Hero and Superhero are positioned at the north and south ends of the public plaza at 1095 Avenue of the Americas between 41st and 42nd Streets and they are, of course, worth exploring and admiring.